Switzerland’s long hot summer of 2017 – the hottest for over a century, with temperatures soaring as high as 34°C throughout May and June – was violently interrupted in the first weekend of July when heavy storms finally broke. 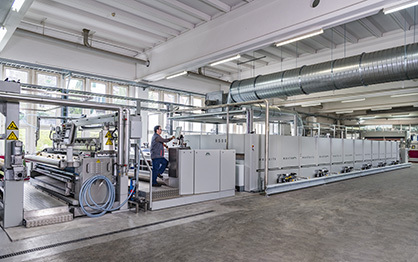 Particularly badly affected was the town of Zofingen in the canton of Aargau, where Bethge AG Textilveredlung has operated as a commission fabric finisher since 1834. Nestled in the foothills above Zofingen, the Bethge plant was in the direct line of a 1.6-metre-high wave which thundered down onto the town when a dam above it finally burst its banks. More than 450 rescue workers were mobilised to deal with the chaos in Zofingen, with the electricity down, the railway station underwater and the motorway around the town closed in both directions for many hours. Miraculously, although a number of people were taken to hospital, nobody was killed, but the freak storm had caused millions of francs worth of damage, with the Bethge plant taking the brunt of it. The following week a crisis meeting was held by the directors of the family-owned company and it became clear that its finishing lines – including the existing Monforts stenter and shrinkage range – would have to be completely replaced. “It really looked like the business was finished unless we could resume operations in a very limited amount of time,” Mr Katzenstein said. “For many years we have specialised in the finishing of woven textiles for third party brands and distributors, primarily based on cotton and linen, as well as some polyester and polyamide. These are destined for the home and hotel tableware and bedding markets in Switzerland, Austria and Germany. “Hospital linen is another key end-use sector for our fabrics, and as one of the few remaining textile finishing operations in Switzerland – where both costs and environmental standards are extremely high – our just-in-time delivery and quality guarantees have been crucial. Bethge opted to order two new energy-saving six-chamber Montex stenters, as well as a Monfortex compressive shrinkage range which is characterised by a larger shrink cylinder allowing for longer processing paths to achieve enhanced shrinkage values. The first stenter was manufactured at the Montex plant in Austria and was delivered, installed and commissioned in a record time of less than four months. “We were able to salvage our existing air cleaning system and after the first of the new stenters was up and running we were able to resume operations and build up back to where we were, month by month,” Mr Katzenstein said. All of the Monforts lines have working widths of 3.4 metres and benefit from the latest Qualitex 800 control system. This has all of the familiar features of touchscreen smart phones and tablets, making navigation extremely easy and cutting down the time required for becoming familiar with the system. Operation is via touchscreen and wheel-effect selection and the dashboard can be individually configured to meet the exact needs of an operator’s tasks. 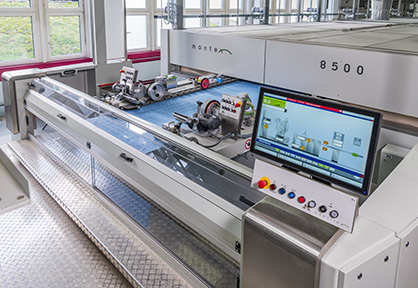 The second Montex stenter that has been installed at the Zofingen plant is equipped with the latest Monforts texCoat system, as an extension of Bethge services to its customers. As the only manufacturer which is able to offer completely integrated coating lines from a single source, the latest Monforts coating heads are tailored to the company’s drying technology for maximum benefits. Monforts offers multi-functional coating heads for its texCoat units, with modules that can be integrated into new lines or retrofitted into existing ones. 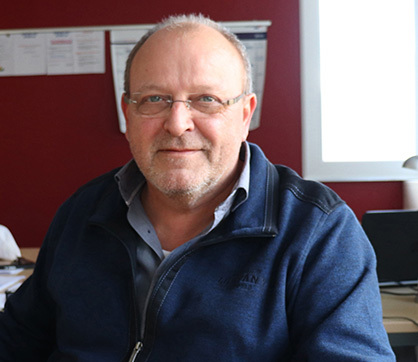 In addition to its main markets, Bethge also manufactures certain technical textiles, as well as Damast fabrics and voiles destined for Africa’s apparel markets. The company is now back to full production, finishing some three million metres of fabric annually.